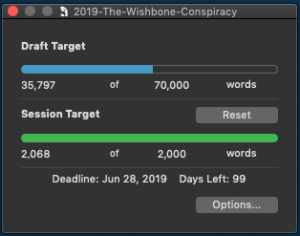 This was a good writing day, in spite of the fact that I slept in, AND in spite of the fact that I had a hard time getting started this morning. Pushups and coffee only go so far. Problem was, I woke up at around four AM, and couldn’t get back to sleep, so I went out to hang out with Matt for a while, played several hours of No Man’s Sky, and then napped for about an hour starting at 8 am. Got Cady into a desperate situation, in which in spite of having taken every conceivable precaution, she is now disarmed and on her way to a process she knows is one hundred percent certain to kill her. And will have absolutely no opportunity to escape. And I have just set the stage for the second conspiracy in the novel, the one that is the reason for the current (probably awful) working title. Which I hinted at earlier, and which is going to have a nifty little twist before I hit my ending. The Mid-Point Twist (for HTWAN students reading this) was completely unplanned, but it fit within the structure and world I’d built, so it evolved to surprise me. I love when that happens. Time now to get going on the other work of the day. But small happy dance here, because I am halfway done with this The Wishbone Conspiracy, and I still love it.